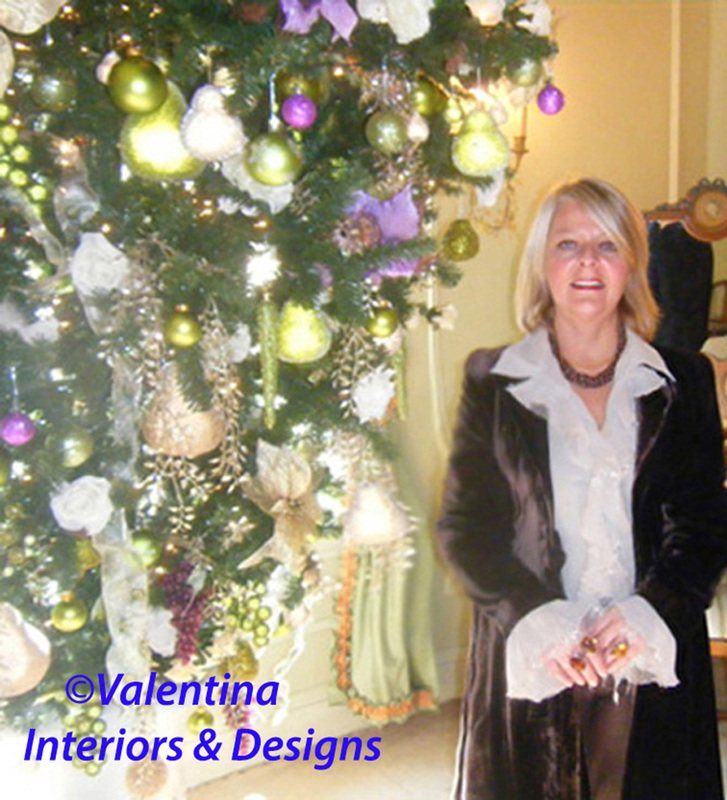 This year I feel very honored to have been one of the designers selected to decorate Christmas at the Historic Ainsley House in Campbell, CA. 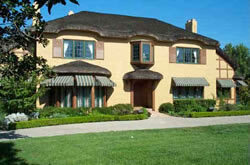 The owner, John Colpitts, a British native, built the House in 1920s as a retirement home. John came to California in the late 1800s and made his fortune canning food, which he exported to England to his brother. This year Christmas theme was “Christmas Around The World”. 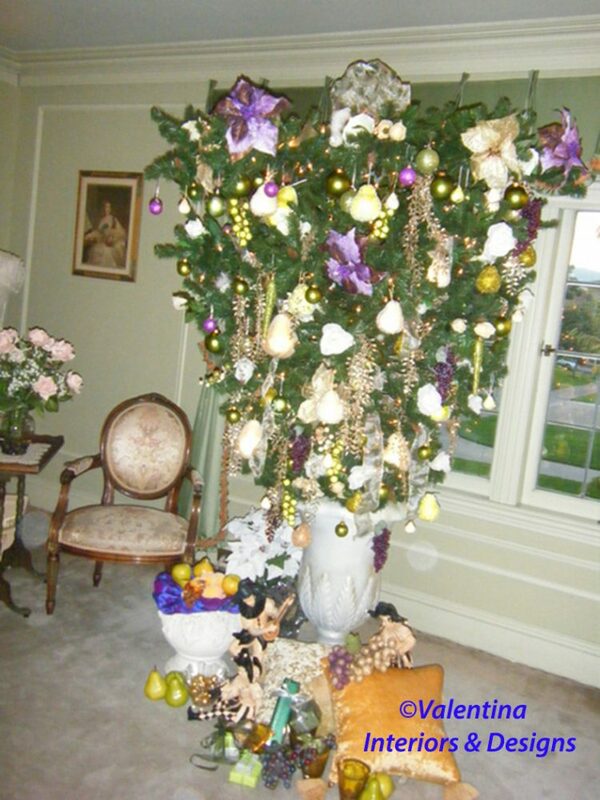 Being Italian born I thought of bringing a bit of the Amalfi’s flavors into my decorations, with citrus fruit, grapes, roses, camellias and the typical poinsettia. My color scheme has been platinum, green, white, with a touch of purple and gold as accents throughout the guest bedroom, boudoir, closet and cosmetic parlor. The guest quarter is a very delicate room, with powdery pastel colors fit for an elegant woman. Original 1920’s dresses are kept beautifully on mannequins and inside of the closet, while originals accessories peek through an original traveling trunk resting in the boudoir. I was so surprised to see a cosmetic parlor in the boudoir. It is a simple pedestal sink with a lighted mirror above and monogrammed face towels hanging on the bar, all concealed beyond a door when not in use. What a nice feature! Small features and details such a cosmetic parlor have ceded the way to large bath spaces, which I feel at time they are totally sterile and without a soul. While I was in the attic of the House selecting the items for my Christmas decorations, I felt so much part of that era. The director was telling me that J.C. the owner, kept his liqueurs in the basements beyond some wood panels. The Prohibition Law marked the era, but we all know that when something is forbidden, we want exactly the object of sins. The story goes that the highlight of the Ainsley’s parties was to turn all the lights off and make the guests find the door to the basement where the liqueurs were kept. Going up and down the stairs from the attic, I could not help admiring the hardwood floor beautifully concerted almost as inlay work, the type of setting that would require the artistry and clinical eye of an ebonist. Custom flooring is another area of designing that has ceded the step to a less expensive and faster application. The House was designed with 15 rooms in a style of Tudor Revival architecture with the influence of Arts and Crafts movement of the 1920s. The most striking feature is the English style thatched roof, remade in 2007 as a faux thatched, but one can also admire the half-timbering façade, the interior wood paneling, the multi-paneled windows and the bay windows, especially the corner one at the breakfast room. During my conversation with the curator/director, I learned that in 1990 the House was lifted up in its entirety and moved about 1.5 mile to the present location in Campbell, CA. One would think tiles would come apart, floor would open up and walls would create cracks during the house moving, but nothing came undone. Workmanship was really a mastery, I can adduce. The modernity of the guest bathroom style really struck me, the entire bath is quite spacious. The tub is enclosed in a Tudor style alcove surrounded by Nile green tiles, the shower is separated from the tubs, enclosed with a glass door and finished with the same color tiles with three water jets, a very avant-garde detail to find in bathrooms of that era. A deep linen closet and an enclosed W.C. make this a desirable spa, just as we intend it today. Alcinda was in love with John Colpitts, who was a workaholic with a strong character and played hard to get. The only way to get him to pay attention to her was to accept a job in his firm as his bookkeeper. Alcinda was 17 years younger than John, but she became his wife at last. A medium, while visiting the house a few years ago, felt a massive male energy, so I was told. I felt the same while I was decorating the upstairs guest bedroom, an enveloping warm male presence, perhaps he was a woman’s charmer. He had many visitors from Europe sojourning in his house. I can see the care that was given to the guest bedroom, made delicately elegant and comfortable for a woman. For the same reason, I wanted to give the room the same gentleness using soft Christmas colors and a certain daintiness with the flavors of romantic Amalfi. The Ainsley House will be open everyday from Nov. 20th to Dec. 19th. Calendar of events will include: Holiday Teas and Tours, Holiday Boutique, Photo with Santa and Holiday Open House. 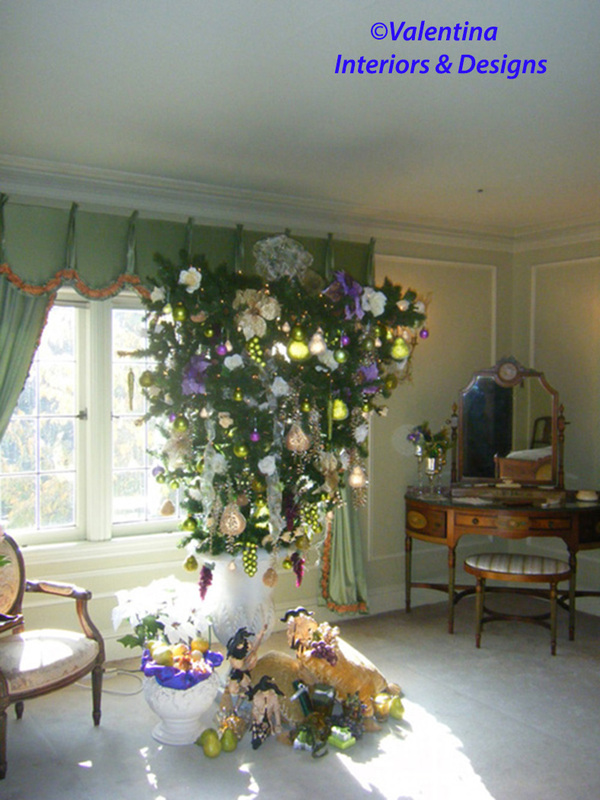 I have enjoyed the experience of caressing the past in a prestigious historic home and especially have enjoyed the comments on my upside down tree. If you are referring to the theme as the look of my page, than I chose it from the selection avalaible in WordPress. This is a beautiful post. Thank you. I will plan to visit this house. The Ainsley House will be open until Dec.19th. It is an original 1020 style. Thank you for reading.